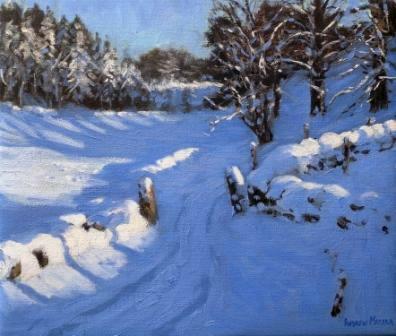 The Limited Edition print ''Stone Posts'' is one of Andrew Macara''s distinctive winter snow scenes. His skilled treatment of light and shade observed in the Derbyshire countryside is always impressive. The viewer is taken on a journey through the narrow entrance of the stone posts flanked by snow covered dry stone walls up the hill and beyond. There are no signs of the gate or people which might indicate it is a neglected location, but the tracks in the snow provide a different story. In addition to Red Rag Gallery Andrew Macara limited edition prints have featured at other leading British Art Print Galleries. Andrew Macara art prints feature in many private art collections throughout the world. All Andrew Macara signed limited edition prints from Red Rag Art Gallery have been reviewed by the artist. This guarantees that all art prints offered by Red Rag satisfy the high quality and fine art standards set by Andrew Macara for prints. Each limited edition print series from the Red Rag British Art Gallery is available for immediate delivery and can be shipped worldwide. Click here to view more contemporary limited edition prints by Andrew Macara.